Metal Technology realises that a firm commitment to environmental matters is of great importance to a well run and efficient business. Accordingly, we believe that we have a responsibility to work with our suppliers and clients in minimising the environmental effect of our work wherever and whenever the case may arise. Below are some of the ways we're helping to reduce our impact on the environment. Metal Technology is wholeheartedly committed to minimising all waste associated with the company and its product. This is actively progressed on two fronts, within its own office environment and through the product it sells. Where we can influence the design and use of our products in developments, we will base decisions on a sustainable basis where the health and safety of the occupants can be combined with the conservation of resources for future generations. As an industry we are using resources more efficiently with the minimum of energy consumption, to deliver a project that is flexible, durable, has longevity, and where practical, using fixtures and fittings that can be reused. ISO 14001 is an international quality system for environmental management, providing a framework to allow businesses to minimise the impact of their operations on the environment. It seeks to establish a company policy for planning environmental objectives and for complying with laws, directives and regulations. The intrinsic qualities of aluminium, its infinite recyclability, strength and lightness, durability and low maintenance qualities mean it is one of the most sustainable building materials that can be used. Aluminium is the earth's third most abundant element after oxygen and silicon (ahead of iron). Aluminium does not emit dust, vapour or particles and is not toxic to touch. Given its durability and resistance due to applied surface treatments such as anodising or powder coating, aluminium structures need only regular cleaning with neutral detergents followed by rinsing with water. Aluminium is non-flammable and, when it reaches its melting point in the event of a fire (about 650°C), it gives off no flammable gases or vapours. Recycling is a valuable asset in the battle against the greenhouse effect. 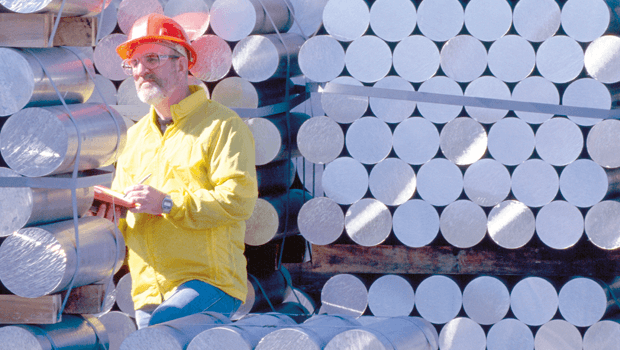 The global aluminium industry has made great strides during the last century to reduce its environmental impact at all stages of the supply chain. Aluminium extraction and refining companies have reduced their energy requirements by almost 70% since 1900. Aluminium extraction has seen the growing use of hydro-electric energy coupled with a vast increase in aluminium that is recycled. At present more than a third of global aluminium production is from recycled metal, a figure that is growing. Recycled aluminium takes just 5% of the energy needed to produce primary metal with a consequent reduction of 95% in the greenhouse gases produced. The recycling process is economically attractive and viable. Recycled aluminium meets almost 40% of the demand for the metal in Europe. Approximately 70% of the material used to produce Metal Technology extrusions is recycled. Aluminium is infinitely recyclable with no loss of its properties. The Delft University of Technology in the Netherlands has investigated the collection rate of aluminium in buildings. Demolition case studies in six different European countries (France, Germany, Italy, Spain, the Netherlands and the United Kingdom) were carried out and the data collected shows that collection rates are over 95%. The purpose of recycling is to produce new high quality material from waste and used products in an economical and environmentally friendly manner. There are generally two kinds of raw material for recycling, process scrap and waste from the aluminium industry. The process scrap is easy to identify and it has a well known composition, while on the other hand aluminium from used products is much more complex. However, both types of scrap can be processed and recycled to a high standard. Gasketry must be manually removed from the window as part of the deglazing process. Material is then sent to a rubber recycling plant where it can be re-smelted or ground into granules. In many of these cases, the stainless steel has suffered little degradation and still contains a high value of the initial alloying elements such as chromium, nickel and molybdenum. This makes it a valuable source of those constituents to the stainless steel producer and a high proportion of material going into the melting furnace is usually recycled. Metal Technology Aluminium products are 100% recyclable. It is Metal Technology's aim to continue to develop its recycling theme within the building industry in order to realise its environmental plan for the future. Hydro Aluminium extrudes and Metal Technology profiles score highest among aluminium companies in the Dow Jones Sustainability Index (DJSI) rankings. Two thirds of the energy that the Hydro Group uses to produce its primary aluminium comes from renewable sources. In parallel, gains in the efficiency of processes have made it possible to reduce the amount of electricity needed to produce one tonne of aluminium by 33%. Used metal recycling is one of the areas that Hydro will concentrate on going forward. The amount of recycled metal will increase during the coming years. In 2012 Hydro will double the volume of aluminium scrap the company recycles. Hydro extrudes Metal Technology profiles. As part of an agreed programme of sustainability approximately 70% of the metal used in Hydro's extrusion process is recycled. This metal requires only 5% of the energy necessary for the production of primary aluminium, giving Metal Technology profiles a greatly improved environmental footprint. Within the powder coating industry, AkzoNobel lead the way in eliminating substances of concern. They do not manufacture powder containing toxic lead pigments. AkzoNobel are the world leaders in TGIC-free technology (triglycidyl isocyanurate, a cross linker used as a curing agent in powder coating since the 1970s). Powder coating products have many environmental benefits. A powder coating is made up of raw materials, similar to other coatings, but without organic solvents. As a result there is no volatile release of organic compounds (VOCs) into the atmosphere during application. Also, as no solvent is required with powder, there is a reduction of fire risk during storage and handling. The unique methods of application of a powder coating allow the solvent-free product to be applied in a one coat process and any excess powder is collected and reused. The powder coating paint application process results in high utilisation, low wastage and an economic applied cost. The Green Guide to specification provides clear and easy to use general guidance to allow designers to reduce the environmental impact from individual construction products used in buildings and can be used to support BREEAM labelling. The British Research Establishment's Environmental Assessment Method (BREEAM) is a design and management stage assessment tool which takes into account associated points from each products alphabetical rating to establish various environmental levels for a building (i.e. good, very good or excellent.) It is interesting to note that the glazing element represents approximately 3% of the overall numerical score for a typical building. Commercial window ratings are the same for the following building types: Health, Offices, Retail, Industrial, Education, Housing (high rise where relevant). Based on calculations and the profile mass formula as set out by BRE's Green Guide, Metal Technology's high insulation (Hi+) windows can achieve an A rating. 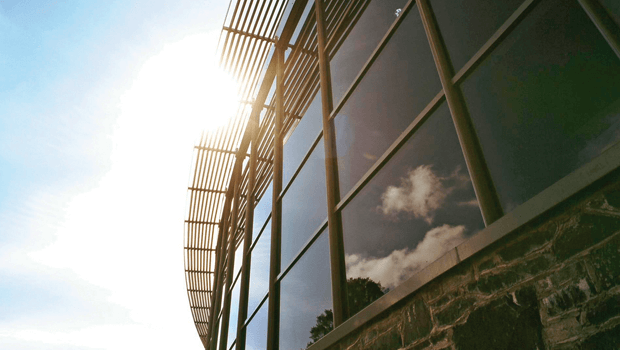 As a supplier of aluminium building products, Metal Technology is committed to using the 'green' advantages of the basic material throughout all its products. This takes into account environmental factors, such as production methods, life cycle waste management, energy balances and life cycles of the aluminium it uses. With an in-house BFRC approved thermal simulator, Metal Technology has worked closely with its glass and polyamide suppliers in conjunction with the BFRC to launch new thermally efficient window systems that can deliver cost effective A rated WER windows. Metal Technology can now offer a thermally efficient range of windows offering U-values based on the standard GGF window which can produce U-value figures below 1.0 W/m2K. This is supported with Curtain Walling that can accept photovoltaic panels, Brise Soleil systems offering substantial reductions in solar gain and louvres that can be used as part of an overnight pre-cool building cooling design. Metal Technology is committed to complying with all current relevant legislation regarding Environmental Safety and Industry Codes of Practice. Metal Technology can in conjunction with their customer, develop a project specific Environmental Management Plan which addresses the relevant environmental issues particular to that project. To provide our customers with a high quality service and end product which will in turn improve and maintain the environment. To avoid all forms of pollution. To ensure our land and water are in good condition for our future generations. This Environmental Management Plan will include a site specific environmental risk assessment which identifies any potential environmental hazards and identifies and prioritises the measures that need to be taken to eliminate or minimise the risk to the environment. Metal Technology recognises that good management includes all environmental matters and will ensure that environmental protection and the prevention of pollution are part of all decisions, policies and practices. Provide for the setting and achievement of environmental objectives and targets for the company, and secondly for the publication of these objectives and targets by the posting of the document in the company. Maintain efforts to achieve continual improvement in the environmental performance of the company, the starting point being to comply fully with the requirements of ISO 14001. Measure environmental performance by conducting regular environmental audits and assessment of compliance with the Environmental Policy, relevant environmental legislation and the requirements of the company.